Damn, but it stuck in Don Lawson’s craw—largely because Chuck Zakarian was right. After all, Zakarian was slated for the big Mars surface mission to be launched from Earth next year. He never said it to Don’s face, but Don knew that Zakarian and the rest of NASA viewed him and Sasim as Mikeys—the derisive term for those, like Apollo 11’s command-module pilot Mike Collins, who got to go almost all the way to the target. Yes, goddamned Zakarian would be remembered along with Armstrong, whom every educated person in the world could still name even today, seventy years after his historic small step. But who the hell remembered Collins, the guy who’d stayed in orbit around the moon while Neil and Buzz had made history on the lunar surface? We’re thrilled to have a story from Robert J. Sawyer this year, and it’s a doozy too, 4000 words of excellent SF and a fitting culmination to the Last Contact theme. This brings to an end our teasers. We hope you will read the rest of the stories (as Paul Harvey might have said) and recommend the collection to friends, family, and fellow supporters of short fiction. The book goes on sale at the Confluence Convention in Pittsburgh this weekend (252 pages, $16) and I’ll post here when it becomes available via Amazon, Barnes & Noble, etc. We also plan on a Kindle edition and various ebook formats for those of you who like your books electric. The full Table of Contents is here. We have a Triangulation panel (readings) on Saturday at 11 AM if you’re interested in reading your story. Can’t promise a packed room, but you never know. Eek! That’s good to know, thanks. Looking forward to the Kindle edition. And congrats on reaching your July Write1Sub1 goals, Steve! Happy to say the Kindle version is now available at amazon. Me again. I’ve just read Miraculous. Really, really good story. Congratulations. Thanks Lydia. I very much appreciate that. Congrats on reaching your September Write1Sub1 goals, Flash Master! You sir, are an inspiration. Ooh, an anthology? Cool. The teasers are wonderful! Just stopping by to say congrats on your progress with W1S1 so far. Stopping by to say congrats on your W1S1 progress. Good luck with the anthology. 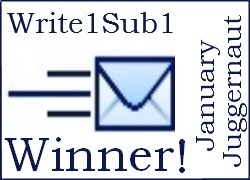 …and congrats on reaching your October Write1Sub1 goals! …and CONGRATS on reaching your December W1S1 goals! Also, I finished reading Triangulation: Last Contact, and it gets two thumbs up from moi.